Meet some of the amazing women who left their legacy and ultimately changed the world through this collection of inspirational audio stories from The Amazing People Club. In this unique story collection, the real lives of iconic women including Mother Teresa, Golda Meir, Kato Shizue and Emmeline Pankhurst come to life. All of these women were leaders in their own fields which included the women's movement, humanitarian work, the medical field and politics however they were all courageous trailblazers in their own way. Understand their real lives and challenges and be inspired by what they did and how they achieved it. This is a must-read for every woman seeking inspiration. 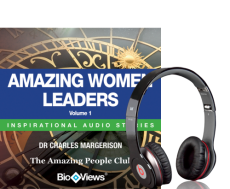 Meet some of the world’s most amazing female leaders through BioViews®. A BioView® is a short biographical story, similar to an interview. These unique stories provide an easy way of learning about amazing people who made major contributions to our world and can help you achieve your ambitions in your journey through life.